Tanis, Egypt, circa 1939. On the brink of World War II, an excavation team led by French archaeologist Pierre Montet unearthed an intact royal burial chamber containing treasures that rival the riches found in Tutankhamun’s tomb almost two decades before. But while the Tut discovery created an international sensation, the opening of the tomb in Tanis made barely a ripple in a world focused on impending war. Now for the first time, we can examine this remarkable and long forgotten find. One of the most spectacular discoveries inside the crypt was the exquisite silver sarcophagus of Pharaoh Psusennes I, an, up till now, a previously little-known ruler who governed Egypt more than 3000 years ago during one of its most difficult periods. As far as we know, this is the only time a pharaoh’s mummy was entombed in silver. The story of the sepulcher and of this virtually unknown pharaoh helps fill in some of the gaps in ancient Egypt’s history. After Montet made his discovery, he raced to get his family back to Europe before the outbreak of war and the treasures he found were transported to Cairo for safe-keeping. There, they remained vaulted and unstudied, until now. In the season premiere of THIRTEEN’s Secrets of the Dead, a team of Egyptologists decodes hieroglyphic clues and pieces together forensic evidence left behind by Psusennes I, whose lost legacy could rewrite Egyptian history. Narrated by actor Liev Schreiber (Salt and X-Men Origins: Wolverine), The Silver Pharaoh traces the recorded history of the relics and offers forensic analysis of the noble necropolis to reveal political intrigue, a lost city and a great leader who united a country in turmoil and come to be entombed as the Silver Pharaoh. The tomb of Psusennes I is being heralded by Egyptologists as one of the major artifacts of ancient Egypt. Montet discovered it almost by chance after his team excavated a raided tomb merely 10 yards away. The casket’s craftsmanship and riches inside the tomb suggested Psusennes was among the mightiest of kings. Yet, scholars knew little about his life and times. Now, recent research paints a portrait of a political mastermind. Beyond the tomb’s precious possessions, it contains a wealth of archaeological evidence about Egypt’s enigmatic era known as the Third Intermediate Period. At that time, Egypt was a fractured kingdom divided between rival rulers of north and south. 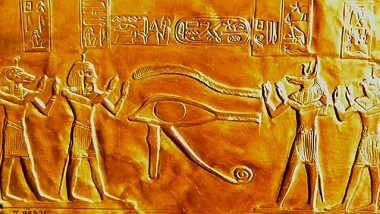 High priests seized power to command the southern region from Thebes while deposed pharaohs were exiled north to Tanis. Psusennes ruled from this province for an astounding 46 years. This was an impressive feat compared to Tutankhamun, whose reign lasted a decade. In fact, study of Psusennes’ skeleton showed a hardworking man who suffered a debilitating rheumatic disease but lived well into his eighties. His physical resilience contributed to his success as a great leader who eventually united Egypt. Archaeologists were able to determine how Psusennes amassed his fortune and authority by decoding his cartouche, a royal seal stamped on the objects. The first clue was found on an ordinary silver dish. Marked on it was Psusennes’ signature along with a series of hieroglyphic inscriptions citing his titles. Surprisingly, he was not only a pharaoh but also a high priest. Additional investigation showed that he had his daughter marry his brother, a high priest in the south. In doing so, he cemented his family power and united the country. 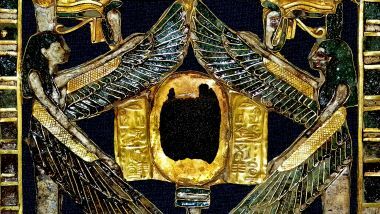 Furthermore, archeologists found another cartouche on his sarcophagus belonging to Merenptah, son of Rameses the Great. Merenptah died 150 years before Psusennes came into power. Research showed Psussenes was given Merenptah’s sarcophagus as a gift and had his signature added on it. This strategic act solidified his family’s association with historical greats for eternity. Among the most extraordinary findings about Psusennes was his relocation of the metropolis of Pi-Ramesse to Tanis. Pi-Ramesse was the fabled riverside capital built by Rameses II. Its location had puzzled archaeologists for years until Montet discovered its ruins in Tanis. However, archaeologists began questioning Montet’s assumption since the river Nile often changed course. Using radar scans along a previously discounted delta settlement 12 miles from Tanis, they discovered the foundation of Rameses’ lost city. Historians knew that Pi-Ramesse became unlivable when the Nile became too silted at this location and around that same time, Psusennes took the throne ordering the city be moved stone by stone to Tanis. Only a king with matchless power and wealth could command such a colossal task. The archaeological treasure trove found in Psusennes tomb provided a virtual window into an unstudied era in ancient Egypt’s past. The story of Psusennes offered a different version of his times. Instead of constant political upheaval, evidence showed a glorious era of supreme ruling. 3,000 years after the Silver Pharaoh’s death, we can finally fill in the gaps in Egyptian history and restore Psusennes legacy as one of the most powerful pharaohs. THIRTEEN’s Secrets of the Dead: The Silver Pharaoh is a Blink Film production for THIRTEEN in association with WNET.ORG, FIVE, IRV Global Entertainment, and National Geographic Channel for PBS. Andy Webb is Director. Dan Chambers is Executive Producer for Blink Films. William R. Grant is Executive Producer of Secrets of the Dead.